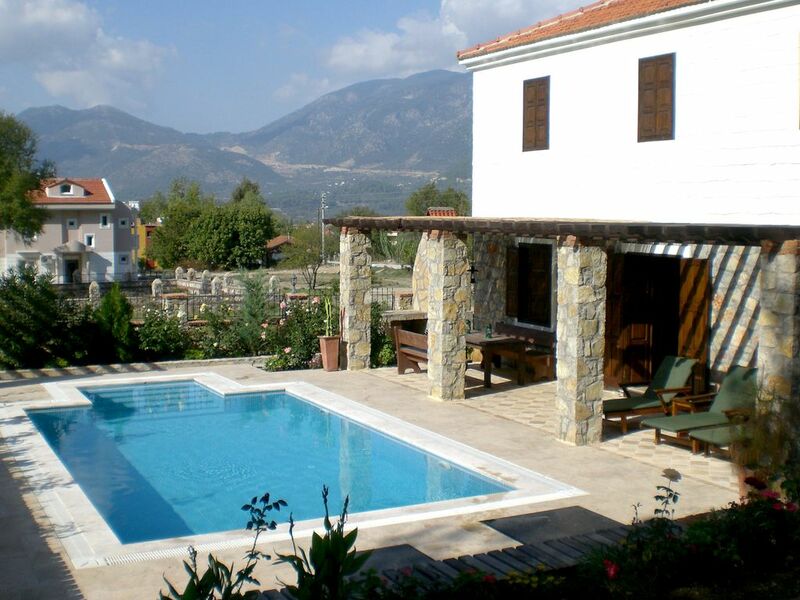 Villa in Uzumlu, Fethiye, Turkey - Idyllic Location, 5 Mins Walk from Village Centre, Restaurants and Bar! Turkish Family Villa is a stunning private villa situated in the traditional village of Uzumlu, Nr Fethiye and Calis beach, and only 45 mins from Dalaman airport. The villa has its own pool (with steps into it) and gated garden, help yourself to the various herbs growing in the garden. The villa is set in a peaceful location with amazing mountain views, but only 10 mins walk from the centre of the village. This is the ideal location for a relaxing and peaceful holiday away from the usual tourist areas, but with easy access by bus or taxi to Fethiye, Olu denez, Hirosinu and Ovaclk if you fancy it. The local region is dotted with archeological sites and areas of outstanding beauty for you to discover. In Uzumlu village you find all you need, their is a 'Wine House' a few family run restaurants, bakery, butcher and a local market on Fridays. After an amazing family holiday in the area, we feel in love with Turkey and its incredibly friendly people and as they say the rest is history... We currently live in London, but long to live in Uzumlu! Its in a very quiet part of the village and feels very private and peaceful, ideal for couples wanting to just be alone or young families to to feel safe, with its gated garden and steps into the pool for the young ones. We purchased this Villa as it just felt like home the moment we saw it. Upstairs bathroom with bath, shower and wc. Downstairs shower room with wc. Poolside shower. The living area is open plan, one side has the kitchen and dinning table with 8 chairs the other side has a large corner sofa (sofabed) and traditional wicker rocking chairs, TV and DVD player. There is an open fireplace for those cold summer evenings! Open-plan kitchen diner with electric oven, gas and electric hob with Extractor fan, fridge, freezer, washing machine, sandwich toaster, kettle. All cooking equipment, crockery, and utensils supplied. Highchair, plastic beakers and plates for the kids! Outside: Outside there are 4 wooden sun loungers with padded cushions a shaded eating area which seats 8 people on benches along a large wooden table, there are 2 sun loungers and a table with 4 chairs under the grape vine round back, an outdoor shower by the pool and a large traditional Turkish stone BBQ (collect your own wood from the forest 2 mins away!). You will also find a traditional wooden Turkish kusht with cushions, which is ideal for relaxing when the sun is to hot or for chilling in the evenings. Guests are welcome to help themselves to tomatoes, aubergines, sweet green peppers, herbs and other seasonal produce from the garden. Cleaning / Towels / Linen / Maid service: Towels and linen are included, sheets will be changed after 1 week. The villa is cleaned before you arrive and once you leave. Extra cleaning can be arranged if required. Stunning views, gorgeous peaceful house ! After arriving late at night I was pleasantly surprised when seeing the house in the light of day. Such a charming house decorated traditionally Turkish . The views were truly stunning and the surrounding landscape exceeded our expectations . As early in the season it was chilly at night but heaters were left out and having the use of an open fire was a nice treat for the evenings after the sun went down of which we loved! There are a few outside areas so plenty of room to be alone and read etc if in a group and the kusht ( chill out area) was such a bonus.I found the peace and the surrounding nature a perfect place to practice yoga and meditation, just the rustling of sheep being herded and wild tortoises making an appearance! The plants,trees and lovely pool around the villa had been well maintained. If you want to go to a bar or restaurants it's a ten minute walk into the village , where we were greeted by friendly locals we also stumbled on a women weaving hand made beautiful scarfs. On Tuesdays Fresh food/ veg from Fethiye food market can be bought to cook in the villa, a great way to eat organically or pick a fish at one of the buzzing restaurants to be cooked. We hired a car so we could explore and found a stunning beach Oludeniz about 20 minutes drive away. Next time we intend on going to the mud baths about an hour and half away in Dalyan....and a boat trip! Too much to write,but I would thoroughly recommend staying at this beautiful villa! We arrived late evening, no moon, dark, only provision in Villa, 2 ltr water, no bread etc. Following morning located village for breakfast and provisions. In kitchen area, 1 cupboard, saucepans stacked in frying pans with oil in; crockery and glassware all needed washing. Fridge and freezer located out of kitchen area, under stairs, fridge was old and could not function correctly, the freezer compartment door was missing. Downstairs bathroom was very small, fittings missing, no place to hang clothes, towels etc, toilet leaked when flushed, grouting missing from floor tiles. Lounge area, uncomfortable seating for 4 adults, bed settee. The twin bedroom was very sparse, no beside cabinets or lights, just single light switch by the door; little wardrobe space upstairs for 4 + adults. Outside, large areas of grouting missing in swimming pool., black crevises, sunloungers in poor condition, delaminated wooden wheels, and varnish stuck to your hands when you moved them, cushions were in poor condition, split and torn. Plastic outdoor furniture had to be scrubbed and hosed, mildew. Longbrush and dustpan broken. BBQ lightswitch in dangerous position, climb on bench to operate, did not work. Sorry to hear you were not happy. I would like to explain a few things that were mentioned as some of the points are subjective. If you arrive at night it will be dark as there is no street lighting near the villa, we do have lights on the wall, which are normally turned on for your arrival, but this time my maintenance man was unable to do this. I have spoken to my cleaner about making sure all kitchen items are spotless. The down stairs bathroom is small, but upstairs there is large bathroom. The swimming pool has now been fully re-grouted. I have replaced the sun lounger cushions. The bedrooms are a bit sparse, as this is a holiday Villa and most people use the outside areas whilst on holiday. The BBQ light does work. We exchanged many emails on your return and in response to your comments I offered you a free week at the Villa, which was not taken. This is a great base for a family holiday. We stayed here for two weeks and explored the many sights and attractions that surround this location. There was something for everyone… from boat trips to islands and coves to haggling for bargins in Old Town Fethiye. Every day the villa provided a comfy and peaceful place to return. The pool was great for lazy days spent around the villa, and the mountains provide a stunning backdrop. Uzumlu is a very traditional village, with friendly locals and great places to eat and drink. Our kids enjoyed getting fresh bread hot out the oven every morning from the local bakery! A great Villa if you are looking for utter peace and quiet. The mountain views are superb as the payer songs fill reverberate around the valley. There is no need to move from the Villa during the day as the pool provides the perfect opportunity to cool down whenever you need to, and is still beautifully warm at night. The BBQ is great for the evening, but if you prefer to eat out the local bars in the village (just 10 minutes walk) are extremely welcoming. They do a cracking breakfast too! I would recommend a walk into the mountains behind the Villa and a short walk will take you into the olive groves of the valley. I'd highly recommend this villa if you are looking to get away from it all. The nearest beach is Calis which is a 20 mins drive. This has a protected area for turtles at the far end. There are a variety of water sports on offer. Calis is renowned for great windsurfing conditions. Within a 45 minute drive you can reach the magnificent Oludeniz beach a designated National Park, which sweeps along for 3km and curves into a beautiful lagoon of calm, clear water. Its sheltered location is perfect for young children. Paragliding and a range of water activities are available. The nearest airport is Dalaman (45 mins away). Car hire is advisable but not essential as the local bus runs regularly from the village down to Calis and Fethiye (when you can get connections to everywhere else). But we recommend hiring a car to fully explore this outstanding region. If you don't hire a car, you will need to get a taxi to the Villa, we arrange this with our local taxi driver. Only 5 minute walk from the traditional village of Uzumlu. 20 minute drive to Calis beach. 20 mins drive to the bustling market town of Fethiye with all amenities. 45 minutes drive to Oludeniz beach and 45 mins to Dalaman airport. Please email us for a PDF of our introduction pack, which includes more pictures. Contract and terms are sent when the full amount is paid.